Probably one of the easier ways to amass a large number of Pokemon, Brigette was more effective in decks that could take advantage of grabbing a lot of Pokemon than in decks that just aimed to grab a Pokemon-EX. Why use your Supporter for the turn when you could just Ultra Ball what you needed instead? Brigette saw some play in different decks like Rainbow Road or Greninja decks, but other than a few niche uses for where decks could utilize its unique effect, it didn’t seem to see that much play. Part of that is mainly in having multiple Basic non-EX to look for, and a lot of decks didn’t run that many when Brigette first came out. However, with the advent of the Sun & Moon era and the Pokemon-GX, Brigette could find new life in other Basics that could be used to evolve up into Pokemon-GX; good candidates could include Eevee or Rowletts! Having her rotate out does slow these kinds of decks down, which is probably for the best. The game is progressing in a mostly slower direction, though powerhouse cards like Buzzwole-GX will likely remain a big part of different strategies. Needless to say, though, Brigette is one of those cards that ended up getting better with time rather than getting worse. Arora Notealus: Kinda strange how the one professor doesn’t have a tree-based name. Unless Brigette is the name of a tree? Although she’s not really a professor come to think of it…Pokemon names can be weird. Side Reviews: Diantha – it seems most modern Fairy decks aren’t really looking to run Diantha right at the moment. It’s hard to explain exactly what it is, but looking at a couple of lists, Gardevoir-GX usually avoids Diantha since you could devote the slot to something that promotes the Gardevoir strategy, while Sylveon-GX decks might use it in the event one of them gets KO’d. Xerneas BREAK seems to be the key deck that Diantha stars in, but with it rotating out of Standard, the card may not see much play outside of Expanded, and even then as a one-of tech card only. Alolan Marowak – despite a strong Energy acceleration and a potentially powerful move, the Alolan deck archetype isn’t strong enough to see competitive play even with Alolan Marowak in its arsenal. It’s likely not Alolan Marowak’s fault though; a deck of multiple Stage 1s and Types can be difficult to manage, and he’s doing his best to fit in while still spinning those flames. Still, Brigette was a big asset to the deck, and having it rotate out is a big loss for the deck in Standard play. Lady – mainly an Energy searcher, and thus it’s only going to be used in decks that want a lot of Energy in hand. As of late, the biggest candidate is anything running a Magnezone or Alolan Dugtrio, which can discard a bunch of Energy for massive damage. Combined with Mt. Coronet, Alolan Dugtrio has the potential to hit for 180 damage consistently every turn! !…assuming you draw a Lady every turn with something that’s not another Supporter. An unlikely outcome, which keeps the deck pretty casual for now. Brigette’s only appearance is in XY Breakthrough and her effect is to search your deck for three Basic Pokemon OR one Basic Pokemon-EX and put them onto your bench, making you choose one or the other and not both. She was reviewed as the fifth best card of XY BreakThrough (https://www.pojo.com/COTD/2015/Nov/20b.shtml). This card saw good usage for decks that really need to fetch certain Pokemon despite giving up their Supporter for their turn. However, because it puts Pokemon from the deck into your Bench, you missed out on coming-into-play abilities that work when put from your hand into your bench such as Hoopa-EX, Shaymin-EX, and Tapu Lele-GX. If this was a concern, you could use Pokemon Fan Club instead. It may be less than one non-EX Pokemon, but it could even get you one more Basic EX Pokemon in your hand, ready to use its coming into play abilities. That was before, but now? The EX mechanic has retired and was replaced with GX Pokemon. GX Pokemon could be Basic, Stage 1, or Stage 2. And since GX Pokemon are NOT EX Pokemon, despite some similarities such as massive HP and being worth two prizes, the ability to fetch THREE Pokemon GX from your deck into your Bench is far superior than looking for EX Pokémon! Because Brigette has been taken advantage of due to outdated or retired mechanics, she saw a resurgence in play when the Sun & Moon expansion came out. Most players would find a way to employ the Tapu Lele-GX/Brigette combo to summon more Pokemon in the start of the game. Brigette will be leaving Standard, and I don’t see another card that does a similar effect. Though if there was one, it would make you search for either three basic Pokemon or one Pokemon GX, to set in line with Brigette’s intended limitations. For now, it seems like Pokemon Fan Club will have a chance to shine regarding usage. 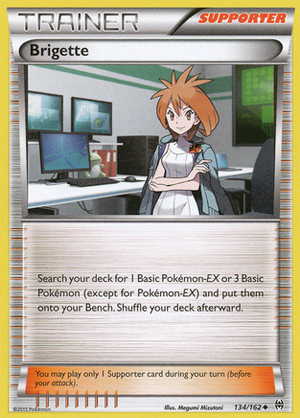 Conclusion: I don’t know if Brigette needed an errata or not, or maybe the designers wants her to promote GX Pokemon. She will be missed, as she does let you access your deck while fetching multiple Basic Pokémon and thinning your deck. It’s like someone woke up one morning and said, “Hmm. I wonder if I play Brigette turn 1, I wonder I can play three Basic GX Pokemon down onto my bench?” So they turned on their computer, grabbed a cup of joe, logged on to PTCGO, threw a couple copies of Brigette in a deck… and the meta was transformed. Brigette, a card mostly ignored for basically the first half of her life, became one of the most common cards in the format. People were throwing four Tapu Lele GX and four Brigette into a deck to maximize their chances of starting with this awesome card. I think that if you ran four Leles and four Brigettes and four Ultra Balls, you had roughly an 82% chance of having one of those in hand turn 1… essentially giving you a Brigette start five out of every six games. Starting with Brigette became the model of consistency. This card defined the format and gave us the perfect start: three Pokemon ready to go turn 1. No more turn 1 donks – Brigette and Lele virtually eliminated any chance of that happening. And most importantly – your early game cards get used early in the game. Now you have less chances of missing out on early game cards early, and because you’ve used many of your early game cards, your mid to late game cards will (hopefully) flow in perfect sequence for you to get those later cards when you need them. Brigette helped us get off to flying starts and allowed us to accelerate our plan of development and potentially remove early game card obstacles that would clog up our decks late in the game. It trailed the other main four Supporter cards (Guzma, N, Sycamore, and Cynthia) and it saw a little less usage lately (10% of all Supporters were Brigette between February and April; 8% were from May 19 through June 23). Brigette’s legacy, however, should probably be as a reminder to all of us that just because a card isn’t particularly useful today doesn’t mean that another card might not come along in the next expansion that turns that mediocre card into one of the best cards in the format. If there is a literal dark horse, laying dormant in its stable, its probably Bridgette. From zero to hero in a flick of a day, and setting a new standard years after its release. No Supporter in PTCG history has ever done this, but yet Brigette will be remembered always as one of the most memorable turnabouts in the game’s history. What Brigette does is that it searches 3 basic Pokemon or 1 Pokemon-EX from your deck to your bench. Back then, in 2014, EXs and fast 1 prize decks rule the meta, and so we have no reliable ways to search Brigette out when we wanted to. Come into play Pokemon-EXs with abilities, such as Shaymin-EX (XY ROS) and Hoopa-EX (XY AOR) are commonplace in EX heavy decks, as they provide draw power to get the card when we wanted them. Even in non-EX decks, there is simply no room for it when you have better alternatives waiting in the corner, such as Trainer’s Mail. But then May 2017 arrived, and there arrives this little cheeky card – Tapu Lele-GX. With its Wonder Tag ability, it can search any Supporter from your deck when you play it into the bench. Finally, after almost 3 years of being benched out, left as a party piece, and amidst a wave of Trashalances, everyone started to cool down in their deck buildings, ditiching cards that would otherwise backfire in the then very popular Garbodor (SM GUR) decks, such as Trainer’s Mail. With Pokemon-GXs being popular too, and some of them being basics and being simply better statwise and in attacking, the infamous “Tapu Lele to Brigette Turn 1” combo was born, and it sets a new era – one where the majority of Pokemon-EX decks were considered obsolete because Brigette can’t swarm them to play while cards like Lapras-GX and Drampa-GX can, as well as being a gateway to a new way to play – more reliant on Supporters and hard drawing from the top deck. Pokemon Fan Club also provided the same effect with the downside of getting 1 Pokemon less, yet this Pokemon can be any Pokemon. Also back then the usage of the stadium “Team Magma’s Secret Base” was at an all time high – why use Pokemon Fan Club that could damage your EXs when you can use Brigette and put them on the bench immediately? These factors allows Pokemon-GXs to thrive and grow, with setup speeds roughly similar to that of the old EX decks. With Brigette gone, the obvious replacement is the Pokemon Fan Club. But will it see as much play as the Bank’s operand? I don’t think so. Pokemon Fan Club has been with us for literally all I know, but it has never see the same level of power as Brigette brings now. I guess Pokemon Fan Club could see niche plays with Tapu Lele-GX around, but that 1 less Pokemon might hurt your setup a bit, even with the help of Brooklet Hill in some decks. Overall, Brigette is a true dark horse – a farmyardian to a contender of Earls Court. And if you’ll excuse me, I’ll go wept the loss of this beautiful combo in Standard.